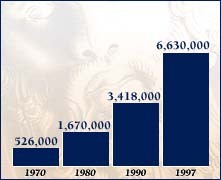 Throughout the 1980s and 1990s, church publications grew with the expansion of local and international Scientology organizations. With the additions of International Scientology News, Freewinds (the magazine of the Church of Scientology Flag Ship Service Organization) and Cause (the magazine of the International Hubbard Ecclesiastical League of Pastors) in this period, Scientologists in every corner of the world are kept abreast of Scientology news and expansion. At the end of 1997, the circulation of local and international Scientology publications was 400 percent greater than two decades earlier.